Got lemon juice? Let’s take a closer look at 10 ways to use lemon juice instead of toxic chemicals for health, cleaning, and beauty in your home. Contrary to all those catchy commercials, you don’t need to use expensive products and toxic chemicals to clean your home, ease a cough, or soften your skin. 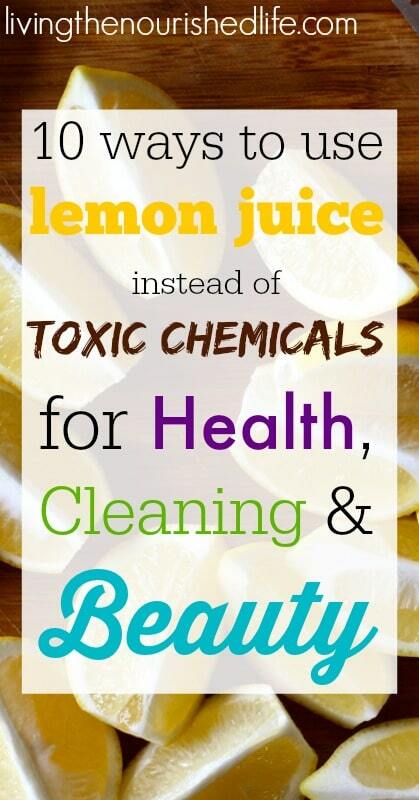 Lemon juice can replace countless bottles of overpriced chemicals for a fraction of the cost. 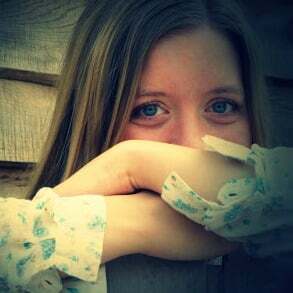 I definitely rest easier using food-based products instead of exposing myself, my family and my pets to potentially irritating and toxic substances. Surfaces like refrigerator shelves, counter tops and cutting boards need to be clean, but I can’t imagine using harsh chemicals where I prepare and store food. Lemon juice is perfect for disinfecting all of these surfaces without leaving behind a toxic residue. It also removes unpleasant stains and odors, so my kitchen is fresh and clean. Lemon juice can power through grease and grime throughout the home. I use a mixture of lemon juice and salt to scrub away grease build-up in the kitchen or other work areas. Lemon juice can also help remove grease stains from clothing (but don’t use on silks or other delicate fabrics). Lemon juice is an astringent, which makes it perfect for treating blemishes and preventing break-outs. It also softens the skin, and over time can lighten scars and dark spots. Mix one part lemon juice with three parts water (or witch hazel) to use as a brightening toner for your skin after cleansing. Adding a little fresh lemon juice to your water during meals can aid digestion. Drinking a glass of lemon water first thing in the morning is said to have a cleansing and energizing effect on the system (some even say it helps you lose weight!). Or try this great lemon detox drink recipe. Stir together equal amounts of raw honey and fresh lemon juice. Take a spoonful as needed to ease coughing or treat a sore throat. I love this because it’s so kid-friendly and it really helps! You can also stir the mixture in with warm water or herbal tea to ease cold symptoms. Buy quality raw honey online here. Yes, the toilet can be icky. But that doesn’t mean you have to use heavy chemicals to get your toilet bowl clean and sparkling. Instead, use a mixture of borax powder and lemon juice to get your toilet looking (and smelling!) like new. Highlights in a box may sound convenient, but in reality hair color can irritate your scalp, damage your hair, and may not even come out looking natural. Save your money (and your hair) by using lemon juice instead! Simply spritz your hair with lemon juice before you go out in the sun. You can repeat as needed to get the level of highlights you want. As a side bonus, lemon juice rinses away build-up and gives your hair a beautiful shine. Use one part lemon juice with ten parts water to clean windows, mirrors, coffee pots and more. Simply give the surface a light spray and wipe away with a microfiber cloth. Make a paste with lemon juice and salt. Apply the mixture to tarnished copper, chrome or brass. Let it sit for about ten minutes, then rinse and buff to a shine. 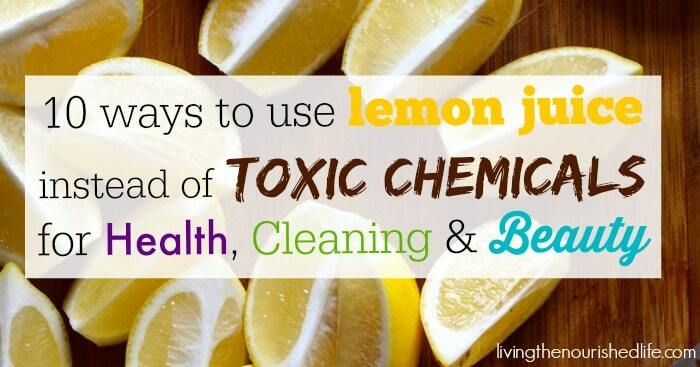 Do you have any tips or tricks for how to use lemon juice around the house? Share them in the comments below! LOVE THIS POST? PIN IT BELOW! Combined with salt, lemon juice and sunshine can also remove rust stains from clothing. I use lemon juice in my rinse water as a conditioner and detangler for my long hair. I do, too! I mix in a little brewed black tea to help with the detangling (but not enough to color my blonde hair darker!) and a little rosemary oil to promote hair growth. It works wonders! I mix it with bank soda and a few drops of dish soap to form a paste, then rub it on all the faucets in my house and let it dry. Wash it off and it takes hard water stains with it! This also worked to rid my new apartments cabinets of layers and layers of grease from the previous tenants! Good idea! I’ll have to try this on my faucets. Definitely! That’s a great way to use lemon juice. I use it on my underarms as a natural deodorant and it works wonderfully when nothing else would! It also helps to lighten the armpit pigmentation! Nice idea! I’ve never thought of that. You don’t have sensitive skin, do you? That sounds like it might burn a bit. rub lemon juice under your fingernails to remove stains. brightens them right up! I had a bad experience with Sun In and now use a natural product, which so far seems ok.